You are here: Home › Blog › Wait a Minute! Not All UPCs Will Work For Amazon? Amazon now accounts for over 44% of all ecommerce in the US, and is gaining market share in numerous product categories. Existing manufacturers are constantly rethinking their Amazon strategy and most new manufacturers plan on leveraging Amazon’s dominance in the consumer marketplace. For identifying books and ebooks, Amazon relies on a 13-digit ISBNs (International Standard Book Numbers) to uniquely identify each title and book format. By utilizing the international standards for book identification, they can be assured that book products sold through any of their programs will correctly tie back to the appropriate title data, book publisher and author. UPC (GTIN) identification is used for non-book items. Amazon formally established their UPC barcode policy in 2016 so they can have better control of ensuring valid product listings and a reduction in duplicate/incorrect listings. The reason they needed to create a formal policy is that many companies where either making up numbers or purchasing UPCs which shared a common prefix (called a GS1 Company Prefix). The GS1 Company Prefix essentially identifies a specific brand owner and the assignment of these prefixes is set by an international standard, just like ISBNs used for books. A quick search on the internet and you will be inundated with misinformation about barcodes and see an assortment of companies selling individual UPC barcodes at low cost prices. So the obvious question is how do you know which option is right for you? Unless someone just makes up a random 12-digit number, all UPCs originate from GS1 (formerly called the Uniform Code Council in the US). HOWEVER, only GS1 UPC barcodes have the necessary brand unique GS1 Company Prefix licensed directly from a local GS1 office. The companies offering individual or discounted UPCs use a common GS1 Company Prefixes and do not represent individual companies. Unfortunately, many companies, both large and small, obtained their UPCs through non-GS1 3rd parties called UPC resellers. When Amazon first launched over two decades ago, they simply required an ISBN or UPC to be listed on their online marketplace and eager sellers flocked to low price UPCs, unaware of the limitations and potential problems. By obtaining GS1 UPC barcodes, Amazon sellers are provided a GS1 Company Prefix which uniquely identifies their company. Amazon, like many other companies, requires the Company Prefix to reflect the actual brand owner and not some 3rd party reseller company. Amazon is now comparing the UPCs on newly listed items with the GS1’s database to validate the GS1 Company Prefix is associated with the brand seller. 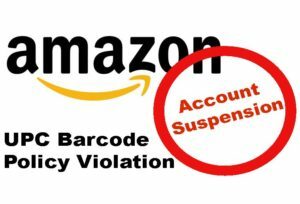 If Amazon identifies a conflict with your UPCs, their Amazon UPC barcode policy dictates your account will be suspended until correctly identified UPCs are obtained and entered. There are thousands of current Amazon sellers who are using and have listed incorrect UPCs on Amazon. Unless an unrelated problem is identifiers or a change is made to a product, Amazon is currently not suspending those sellers’ accounts. Unlike tradition retailers, who commonly have buyers working directly with suppliers, Amazon’s supplier relationship is very distant. Consequently, if an issue, such as incorrect UPCs, is identified, the sellers really do not have an advocate within Amazon to assist them. There are countless horror stories of companies forced out of business when their Amazon seller account becomes suspended. In some cases, sellers loose their customer reviews when a UPC is deemed invalid by Amazon and the impact on future sales is devastating. If you do not recall where you purchased your UPCs or wish to view the brand owner of a UPC, you can check UPC Company Prefix ownership by clicking here. Companies who need to obtain UPCs with a GS1 Company Prefix in their name should click here.